A big congratulations goes out to the surprise winners of the Women’s World Cup of Golf this weekend – Dorothy Delasin and Jennifer Rosales of the Philippines. Well done ladies! It was a joy to watch you and your enthusiasm this weekend, rain or shine. Even my golfguy is excited you won – he thought your team spirit was amazing. The Philippines finished on a three-round total of 18 under par 198, with Korea’s Ji-Yai Shin and Eun-Hee Ji runners-up on 16 under par 200. 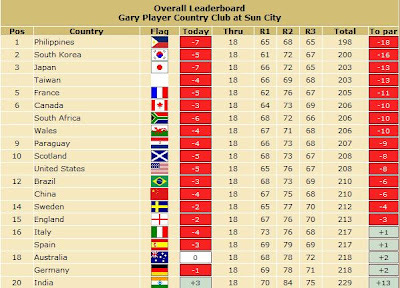 Japan and Taiwan tied for third on 13 under par 203. Ha ha…even the pros love the 19th hole! So what happened to Sweden (the favorites) and the United States? I was sure Pat and Juli would be in the top three. I wasn’t as convinced of Sweden, but still, 14 is pretty low for a favorite going in. Perhaps Maria Hjorth’s illness was the big factor there. It was said she was starting to feel sick on day 2 (which was probably why they dropped from tied for 4th after day 1 to 16th on day 2) and then day 3 she was really ill and needed a medical break early in the round. I can’t imagine how she continued to play. But I was very happy to see Canada in the top 10 – tied for 6th ain’t too shabby gals…well done!. I can’t wait to see you at the Hunt Club in Ottawa this August (my home town) for the CN Canadian Women’s Open. I hear Paula Creamer will be playing along with a number of other greats. Lorena will have to attend to defend her title, so it should be a fantastic event. So the season has finally started and with a bang. It’s over to Hawaii now…you lucky girls you! Pamper yourself on Maui! Book your little piece of heaven in golfers’ paradise. Book now at http://www.vrbo.com/424659 and tell them Golfgal sent you!